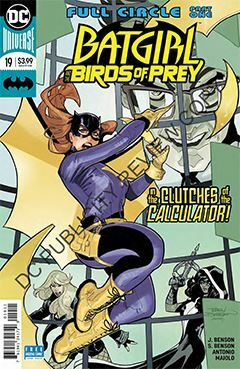 A new story arc begins, as Barbara Gordon contemplates her role(s) on the Birds of Prey team. For one, she’s Batgirl, fighting alongside Huntress and Black Canary. But she’s also Oracle, the tech genius that has hacked her way through the databases of the Gotham City underworld, as well as that of the various supporting agencies such as GCPD, ARGUS, etc. Lately, she’s had a back door to the Calculator’s computer systems, providing her with a variety of intel, and enabling the Birds to take down a number of small-time hoods. The Birds are justifiably proud of their accomplishments, until a tragic loss at the hands of a new foe. Roge Antonio’s artwork in this issue is excellent, and Marcelo Maiolo’s colors are every bit as responsible for elevating the artwork. It adds depth and texture to Antonio’s rendering, while at the same time effectively fleshing out the environment via lighting – or in the case of many Bat-titles, lack thereof. As Barbara struggles with the consequences of underestimating the Calculator, another teammate addresses some overdue issues. What this bodes for the near future remains to be seen, but I expect the next several issues will further the value of one of DC’s under-appreciated properties.